So You Want to Reupholster Your Furniture? Reupholstery may just be the perfect happy medium between sustainable design and personal style. On one hand, you’re bringing new life to an old piece and doing your part for slow design. On the other, you get to pick a fabric in whatever color or pattern that most speaks to your stylistic sensibilities—creating the somewhat unexpected hybrid of a custom vintage piece. Reupholstering your furniture is the answer to modernizing sentimental heirlooms and upgrading that thrifted find you couldn’t help but buy. However, as far as DIY projects go, it can feel super-daunting. “As much as we’d love for our inheritance to come in the form of an original Van Gogh or priceless jewels, it’s often an old chair or sofa that’s 50 years past its prime,” says Amanda Brown, author of Spruce: A Step-by-Step Guide to Upholstery and Design. 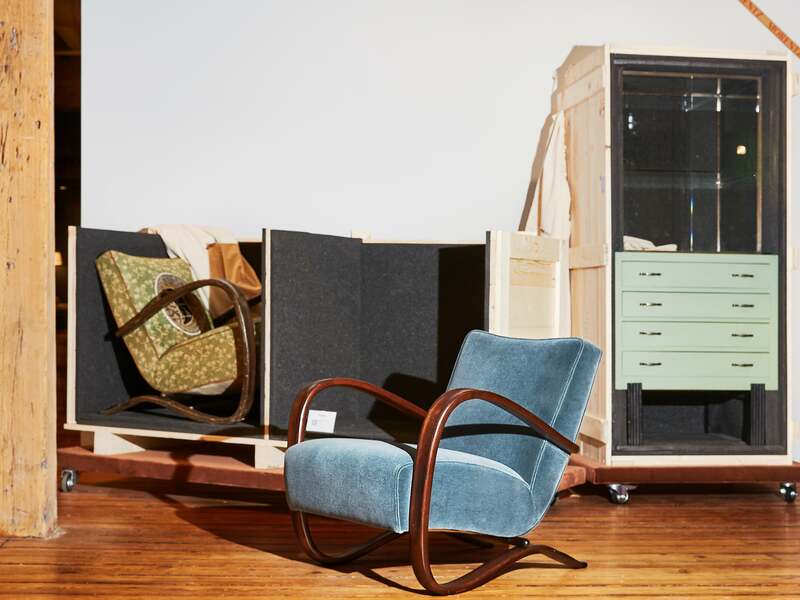 But before you relegate a once-loved piece to the attic, Brown wants you to know that not only is reupholstery a feasible DIY project, it’s a worthy investment. “Older pieces are made from solid woods and are meant to last more than a lifetime,” she explains. “Many new pieces use Styrofoam, cardboard, and inferior padding materials—rejuvenating an older piece can be done time and time again as your aesthetics change.” In short, reupholstering your furniture is the gift that keeps on giving. To demystify the DIY, we turned to some experts to get their intel on all things reupholstery. From the best place to find tutorial inspiration to the must-have tools to what to do with your leftover fabric, they have you covered. Once you’re ready to take the plunge, scroll to the end to shop our edit of the coolest fabrics on the market right now. Even for the most experienced DIYers, it’s important to test a sample before diving in—especially when dealing with precious antiques. Brown recommends starting with a small project, like a dining room chair or bench, to get your bearings before starting a bigger project. And when you do work up to the piece you want to reupholster, be sure you’ve tested a sample first. “Use cheap or scrap fabric to test patterns before cutting into nice textiles,” says Brown. Carrie Waller of Dream Green DIY is also a self-described sucker for YouTube videos. “Seeing the steps laid out in action helps me visualize how each step corresponds to the next one,” she says. For any visual learners, following a video tutorial will be extremely helpful in seeing how the project should go from start to finish—and ensuring you don’t end up with an unwelcome plot twist halfway through your DIY. As much as we love the decades-old charm that comes with an antique piece, the decades-old dust is less than ideal. “Work in a well-ventilated space, especially when taking off dusty old fabric and padding,” recommends Brown. Of course, this depends on what kind of reupholstery project you’re undertaking, but there are a few key essentials that you should have available, just in case. As reupholstery is done primarily by hand, Brown says the only things you need to remove old padding and fabric are a pair of pliers and a staple remover—“and a few blisters!” she jokes. If you’re in the market for something more heavy-duty, Waller’s number-one, can’t-DIY-without-it tool is a high-quality staple gun. “You’ll want something really powerful to get through all those layers of batting and fabric, so I recommend going with a corded staple gun that has the oomph to help you speed through this type of project,” she advises. That said, reupholstering larger items and putting furniture back together can be slightly more complicated, so be prepared. “Larger projects like a sofa require many hand tools and a sewing machine, which could be worth the investment if you plan on tackling several projects and really love working with your hands,” says Brown. Her go-to investment pieces for these bigger projects? A pneumatic stapler and air compressor. While Waller says reupholstery is definitely something most people can tackle at home, she has her limitations. “I draw the line at decorative piping and leather furniture,” she says. “When I have the itch to reupholster these types of pieces, I call in the pros.” Nielson defers to the experts when using stripes or a delicate fabric, just to be on the safe side. “If the shape of the chair is really intricate or curvy, it can be tricky to perform the pattern,” she explains. There’s a reason most people think of reupholstering furniture as daunting: It takes time. “My first armchair took 40 hours to complete!” says Brown. For her, the ideal way to actually learn this kind of DIY is to take a piece of furniture apart and put it back together. Learning through doing is the best tutorial—so just know that if you don’t get it right on the first try, you’re not doomed as a DIYer. Maybe just don’t start out with a priceless family heirloom as your first victim. Failed home ec class? No worries. “You don’t need to sew to upholster,” says Uyeda. “Glue, grommets, and clever folding techniques can all be used instead.” He recommends spending more on materials that don’t require hemming to save time and hassle down the road—plus, they’re easier to work with. Once you’ve successfully upgraded the fabric, the job isn’t done quite yet. Be sure furniture joints are tight and any issues with the frame of your piece are fully repaired to truly give an old item a brand-new look. “Always paint and refinish furniture after it’s been stripped of old fabric and padding,” says Brown. Fabric can be expensive, so if you found a print you really love, try to think of a fun way to reuse it. Brown recommends using extra material to make throw pillows or cording for another project. Waller, who always holds onto leftover fabric post-reupholstery jobs, opts for reusing it in things like DIY curtains or a homemade wall hanging. Her gorgeous Virginia home is proof that recycling can look chic. If you’re not looking to extend your newfound crafting abilities past the reupholstery project, there’s a logical reason to keep the excess, too. “I always hold onto leftover fabric—that way, I have something to take with me to the store when looking for coordinating accents for the rest of the space,” says Waller.